No drop-ins, but email me (headoverwheelscircus@gmail.com) if you know up front you will be missing more than one class, and we can work out a discount! Looking for more than just poses on the static trapeze? Learn to supplement your shapes with amazing dynamic movements. 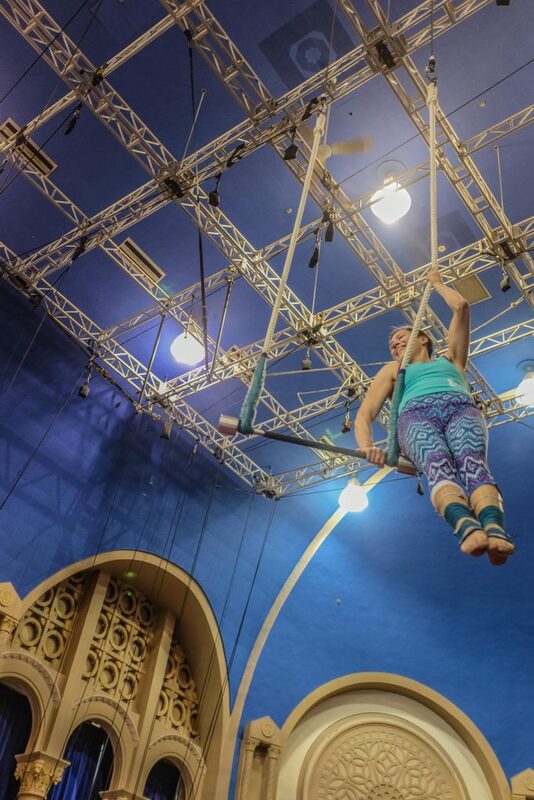 Dynamic Trapeze will cover the building blocks of many dynamic movements, including beats, drops, and circles. In Dynamic Trapeze 1, we will start with establishing a foundation of strength-building, exploring beginning beats, learning about safe ways to fall, and solidifying static positions to which we can later add movement. In Dynamic Trapeze 2, we’ll work on training backward and forward circles, advancing our beats, and building up to training first release moves and twists. In Dynamic Trapeze 3, we’ll refine and revisit skills while building on their difficulty; we’ll also continue to work at our release moves and twisting skills. Carly teaches both German wheel and static trapeze at MCS. She received her aerial teacher training from Carrie Heller of the Circus Arts Institute in Atlanta, Georgia and the Introduction to Teaching Aerials program through Nimble Arts. Since then, she has furthered her personal aerial training with classes in San Francisco, London, Chicago, Québec City, Montréal, and Brattleboro, VT. Coming to static trapeze from a background in flying trapeze and wheel, Carly loves practicing and teaching dynamic movements like beats, circles, rolls, and drops. With beginners, Carly emphasizes strength and fundamentals, using fun teaching drills and conditioning exercises in her classes to help her students gain confidence and make tangible progress over time. Please register using this form. Thank you! You may bring cash or check (made out to Head Over Wheels) on the first day of class, or pay via PayPal (to thenarr@gmail.com) or Venmo (to Carly-Schuna).